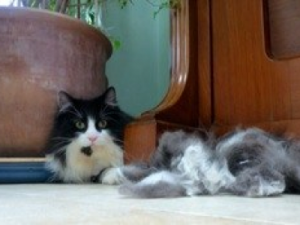 Anita came to groom my black and white long hair, Oliver a couple of weeks ago. He had a number of large matts in tricky and “delicate” places. She showed a huge amount of patience, for a groom that took almost 4 hours. Oliver growled and hissed his way through most of it. He wiggled and wriggled his way out of 2 or 3different head cones and one muzzle. Anita always recognised when he was becoming too distressed to continue, and took time to show me the signs. We took plenty of short breaks to allow Olly to relax again. He was a very glossy looking feline at the end of the process! She followed up her visit with literature on how to groom difficult cats, recommendations on which comb to buy and on high class cat toys. I would recommend her to anybody. She is one in a million! If you have found yourself on this page, are a cat guardian and live in London, then it’s more than likely that you will be seeking a cat groomer to visit your home to groom your cat. Your cat groomer, Anita Kelsey, is experienced, fully trained, and able to visit your home anywhere in London and outside. Your cat grooming tools checked and basic advice given to see you into the future. Anita loves cats and understands their behaviours and patterns. Ollie was happy with Catnips London cat grooming service and your cat will be too! PLEASE CONTACT CATNIPS – CAT GROOMING SERVICE WITH A PHOTO OF YOUR CAT(S) WITH DETAILS OF THE GROOM REQUIRED. ANY KNOWN AGGRESSION ISSUES AND COAT CONDITION NEEDS TO BE DISCUSSED BEFORE AN ACCURATE QUOTE CAN BE GIVEN.